Salon painting from the Planet of the Apes. This picture almost pulls it off. The way the monkeys seem to share a thought on times many generations ago, when their forebears still were born as goldilocks that had to be dressed against the weather, cute but useless creatures. How droll life must have been . . . 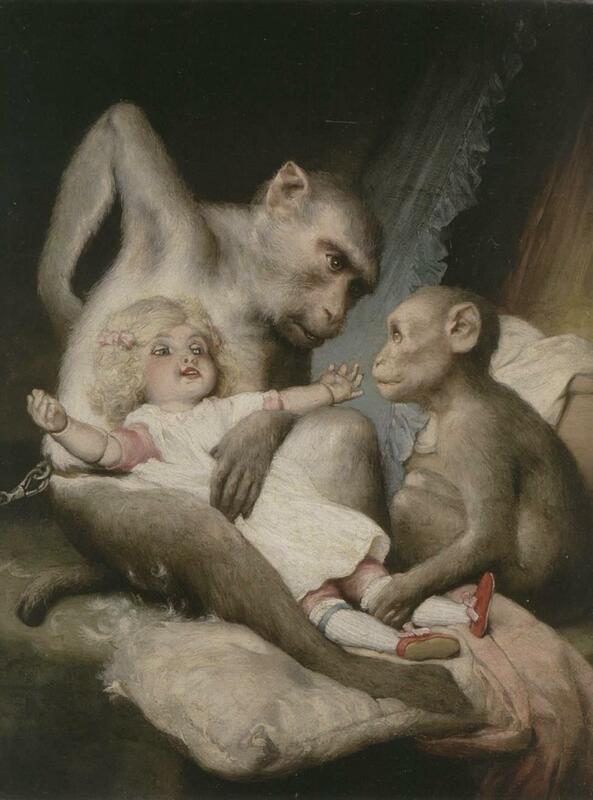 But, boringly, the artist shows the mother monkey chained, giving away the set-up. This is no exploration of the post-Darwinian blues, telling us that evolution will lead nowhere and might as well be reversed, man being the primate that he is. 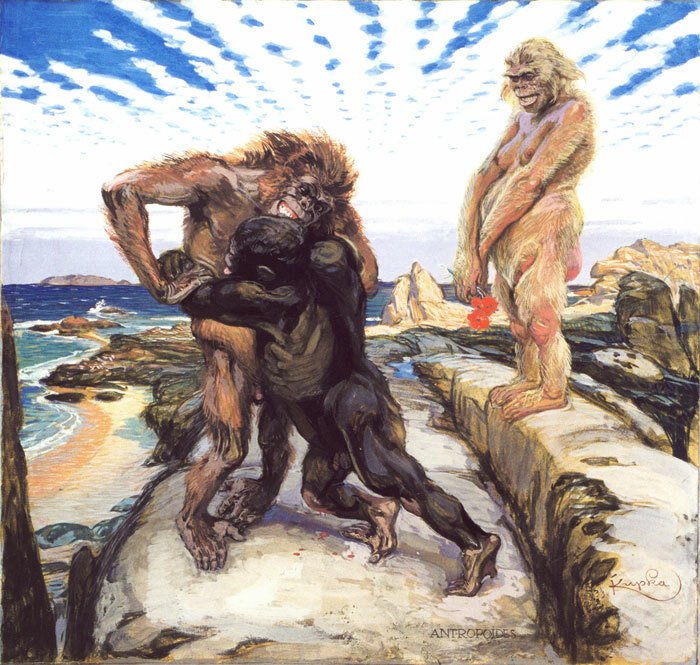 It’s called The Anthropology Lesson, by Gabriel von Max from around 1900, and in its modest aim to stage a droll and entertaining scene about the similarity of monkeys to us human beings—which nevertheless stresses the difference through the meticulously observed gesture of apish back-scratching—this image is safely within a pictorial tradition centuries old, from before the event of evolution, monkeys having been dressed up as people for our entertainment since about the time they first turned up in paintings and engravings. I found the picture in a catalog on Darwin: Art And The Search For Origins, and somehow nothing in their selection of 19th-century images of monkeys really carries the dread that might come with the knowledge that we’re still animals inside, fighting our way through society as if it were a second nature red in tooth and claw. See, for example, this painting by Frantisek Kupka, Antropoides from 1902. It feels like it should be more impressive, ape men doing battle unto the death in full ferocity of unbridled emotions. In fact the dramatic sky above signals impressiveness in its foreshortened clouds. But then instead the viewer’s gaze falls upon the flowers in the hands of the female, and suddenly this is just a lame society joke, more fit for the cartoon page of a women’s weekly. So, the monkeys are a disappointment. By the way I’m interested in two things here, which I’ve already discussed upstream in my post on Edwin Landseer: the idea of a fierce and cruel nature without god (and it might be monkeys are just too close to us to separate themselves from our worldview sufficiently to figure in that), and the humanizing of animals in 19th-century art that seems like a starting point for the evolution of comics. It’s clear how domesticated animals like dogs, cats, mice, etc. would be the obvious cast for a humanized portrayal (as in children’s stories), but shouldn’t there be a special treatment for the monkey? Somehow he fails to inspire, so I turn the pages to see about the other protagonist of the evolution story, the tragic hero, the dinosaur. And funnily, I find that same reversal of the tides as in the Max painting, a Planet of Dinosaurs, exist as an idea in 1830. 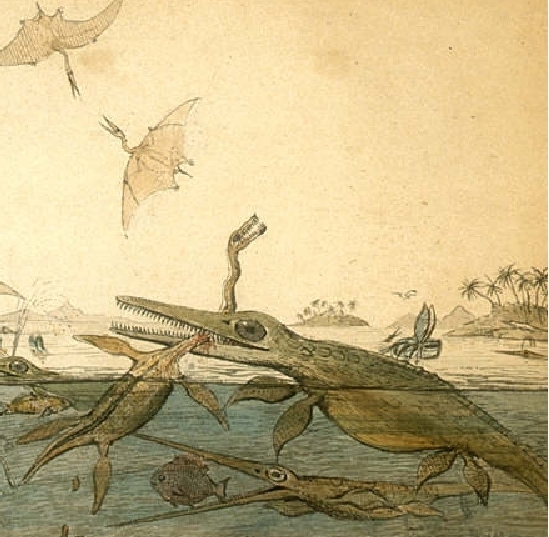 Henry de la Beche’s engraving Awful Changes looks and appears as a pretty funny cartoon, but on top of that holds serious possibilities of a story about a School of Ichthyosaurs. With that apparent fitness of the dinosaurs for the evolution of comics in mind, let’s start again with the Landseer painting I discussed in my earlier post, Saved from 1856, depicting a Newfoundland dog who holds between his paws the body of an unconscious boy he has just saved from drowning. From him, as we have seen, it’s just a small step into the world of Disney. If you zoom in, the composition of the group is remarkably similar to the Landseer, only we’re not in a country where men and dogs are best friends, but where Iguanodons feed on each other in pairs and even groups. Three of them, one properly hunted down and patiently waiting to be devoured between the paws of its captor, who himself cries out in surprise, because unnoticed a third one has crept up on him and is taking a big bite out of the undefended back. Two more are fighting it out in the middle ground of the picture. 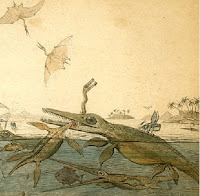 They are surrounded by a beautiful landscape with the sun shimmering through the volcano dust that will soon kill the complete species off (that’s of course not what the artist meant to say, but it sure looks like it, doesn’t it? 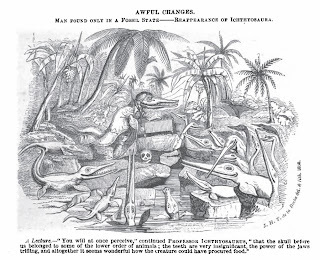 ), and all that the dinosaurs do day in day out is eat and be eaten. 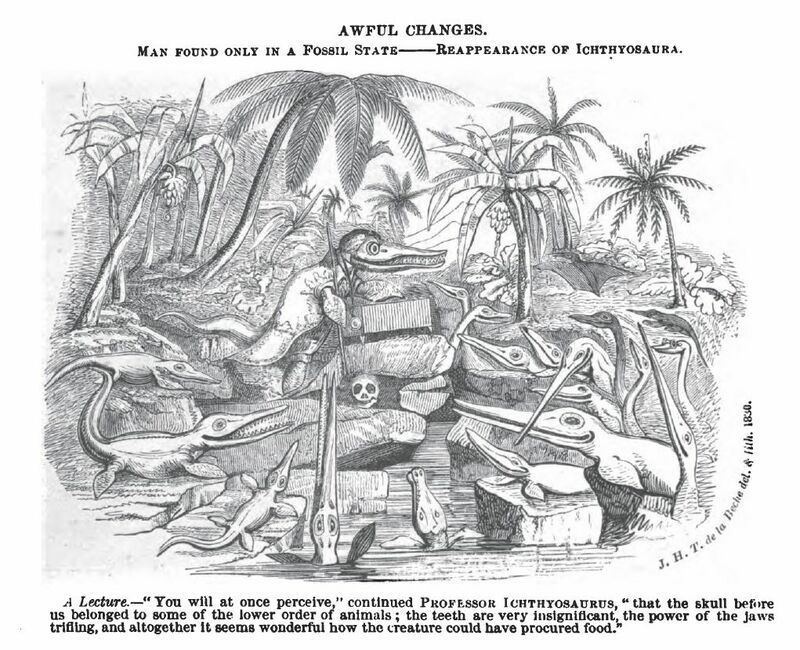 These are Dryptosauri by Charles Knight (who was to become a leading dinosaur painter, creating many images that are still used in books today) from 1897. Well, maybe the feeling I have is entirely subjective, maybe the dinos don’t lighten your heart as they do mine until it screams bloody masterpiece. And maybe the monkeys just look like monkeys because they in fact were, von Max lived with and studied the creatures in his home, while the dinosaurs of course are imagined and would automatically contain more human brainmatter than beings one could observe. 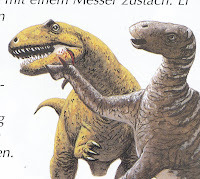 But no, the dinos are also much more like individual characters, not like case studies. They look generations more modern than apes. If I admire them, it’s not because they’re cute like 15 years later Winsor McKay’s Gertie the Dinosaur. No, it’s because like in good comics action is psychology, and my empathy is triggered by the joie de vivre of this soon to be extinct creatures, and by their unconditional readiness to do heroic battle for survival in the face of extinction. The backside to their forward-looking awesomeness is that dinosaurs in comics are strangely unsatisfying, since they have nothing new to offer. 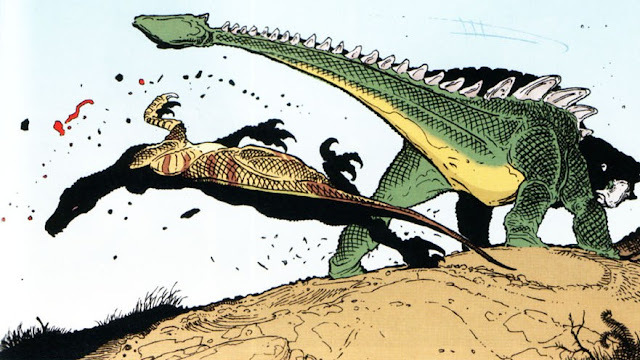 This panel is from Age Of Reptiles by Ricardo Delgado, the first book Tribal Warfare from 1993. Okay, there is something new, the dinos now know martial arts moves. And they can do tail swipes like a Batman backhander, with ornamental droplets of spray blood sailing through aesthetic zero gravity. They act even tougher than they used to, that corresponds to the fact you do not know if Batman is a good guy anymore. But if you look at the earlier pictures above, they all already breathe the same spirit. 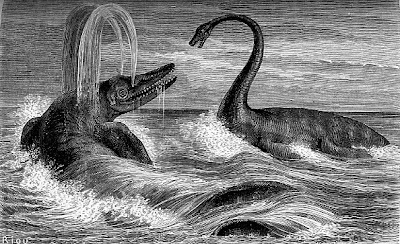 Our understanding of them is still the same: dinosaurs are about survival, that’s their task in life, and since we know they will fail, it’s their symbolic achievement. Evolution has given them weapons that slay like no natural weapons before or since, but in the end they must succumb to the law of Nature like the supervillain to the hero. But they will give awesome battle. 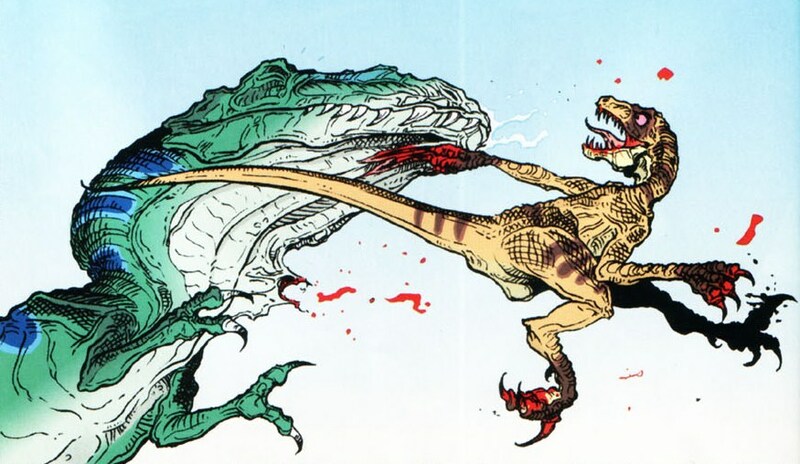 The farthest Delgado can go is show a carnivore kill for pleasure, spitting out his victim after the deadly bite. 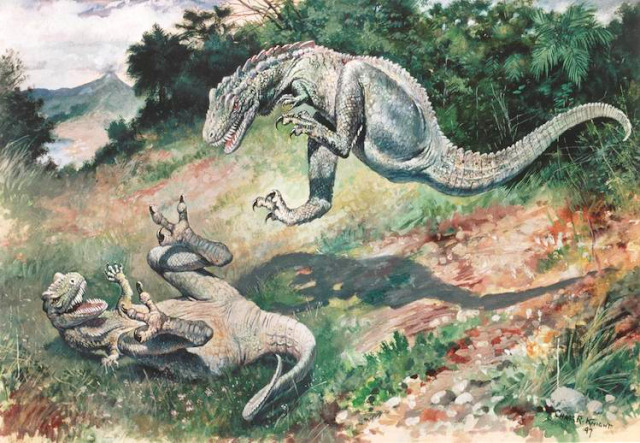 Scroll up again to Martin’s Country Of The Iguanodon and you’ll find even more contentment in deadly violence. Evolution goes on. Next up is the Jurassic Strike Force, I think they’re space aliens creating amped-up bodies from T-Rex genes for themselves to become the ultimate fighting gang of the galaxies (I kid you not), but that’s only next year. Until then, happy holidays.